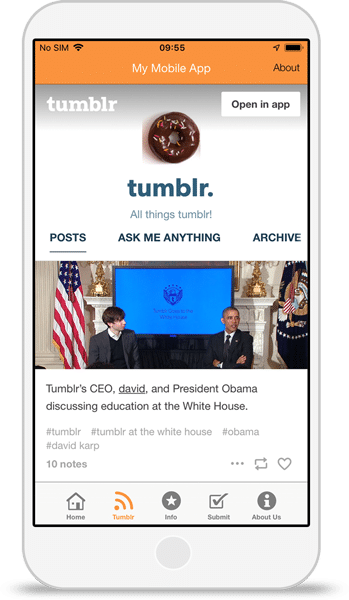 Add your Tumblr feed to your app for a simple way to keep your community connected to your online blog. Select the template that best fits what you want from your mobile app. Using your Facebook and Website URLs we’ll pull in colour schemes, business info and branding. Add the Tumblr tab to allow users to view your blog within your mobile app. Follow our publish wizard to launch your new Tumblr integrated app onto the iOS and Android stores.